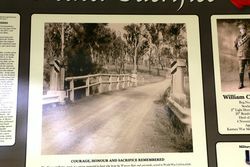 The Bridge Creek (Brooweena) War Memorial Bridge commemorates the nine local men who died in service or were killed in action in World War One. 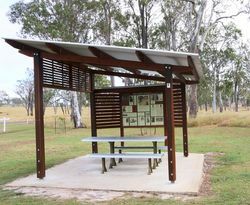 Although there are many different types of memorials throughout Queensland, this is the only known example of a memorial bridge. The bridge was officially opened in 1921 by local clergyman the Reverend Hardingham. Mrs. A. 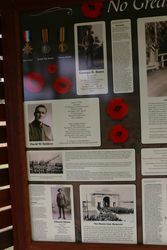 Brown, whose son was among the fallen, performed the unveiling of the honour roll. The bridge was designed and funded by Mr L.S. Smith of Mount Joseph station and, apart from the masonry piers, was constructed by his station hands, some of whom were returned soldiers. 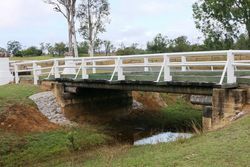 "Sir, I wish to get permission from your local council to construct a bridge over the small creek near Mt Joseph, on the ten chain road just above the present bridge. The structure would have four girders resting on sills at each end, which would be on top of a concrete wall. 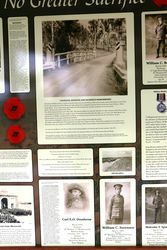 The bridge would be built very substantially and in keeping with the object it is intended for, viz., a memorial to all soldiers who went from Woocoo and fell the late war. 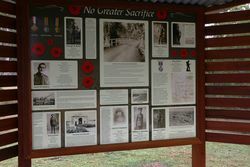 It would be railed with concrete pillars on each corner, in one of which would be a marble slab bearing the names of the boys who fell. Hoping you will see your way to grant this request. — Yours faithfully, Laurence S. Smith." This splendid offer needless to say was gratefully accepted by the Council. Maryborough Chronicle, Wide Bay and Burnett Advertiser (Qld), 14 August 1920. To the honour and memory of A.I.F. 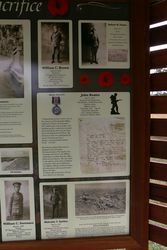 soldiers from Woocoo Shire who fell in the Great War 1914 - 1918.